Unusual suckering, deciduous shrub of lax, open habit with opposite, deeply veined, dark green leaves. Attractive pendulous racemes of tiny mauve-pink flowers, opening very late in the season, late summer or often in autumn. 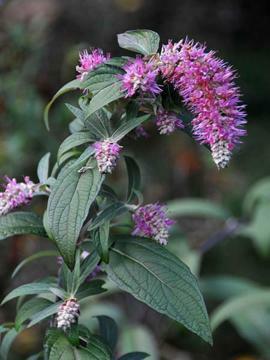 Moist, well drained soil in sun or part shade. In cold winters the top growth will normally die back to ground level, but new shoots appear from the base in spring. In warmer climates the woody growth may persist and attain greater height.